We need a throw back to summer! 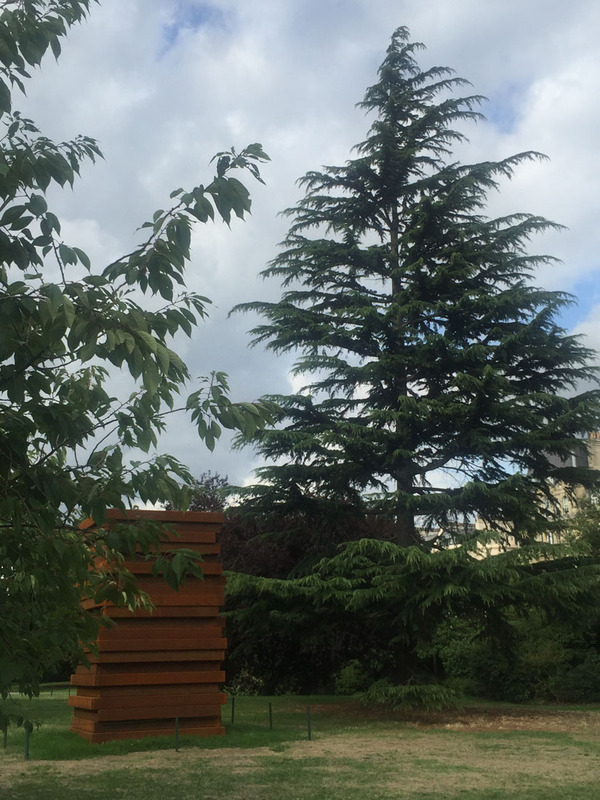 Following on from our sporadic series of art & sculpture in the park! (or from far flung (ish)! places, like Matoshinhos beach). 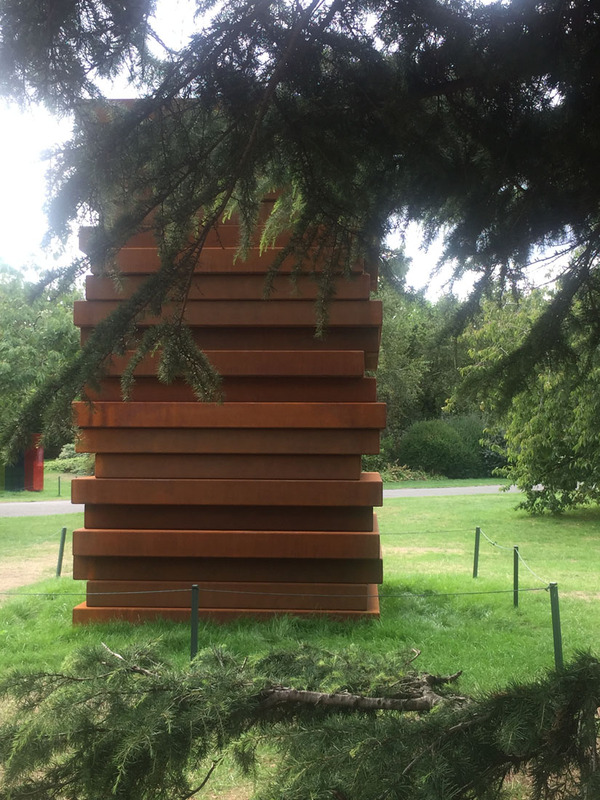 We got to view the artworks curated for the Frieze Sculpture exhibition, in Regent’s Park in August. Diverse, varied, interesting and a vivid snapshot into the artist/s minds, and mixed media materials that they used, to convey a narrative. The exhibition bought together 25 artists from 5 continents and it was such a joy to walk around the art, in a free exhibition, in the open air. (And a gorgeous day to boot)! My favourites are the installations that seemed ‘just right’, in the open space and came alive in the park surroundings. 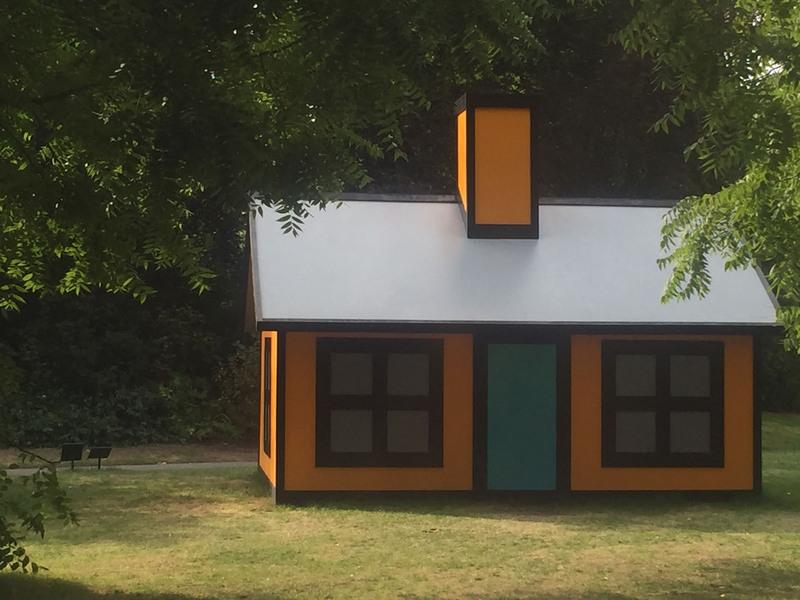 Richard Woods, ‘Holiday Home’, 2018, *see the lovely canary yellow house images. Enamel paint on birch plywood, from Alan Cristea Gallery. Impossible to live in, with no windows or doors; plays upon the idea of sought after locations and the booming market for second homes, amid a crisis of housing supply. I loved the vibrant yellow within the green grass park interior, dappled by summer sunshine. 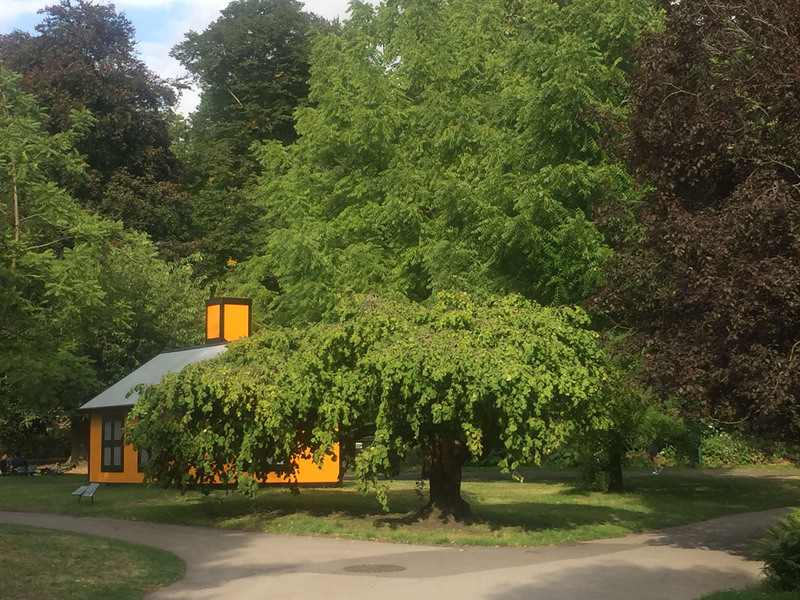 The yellow childish shape, that we all recognise and drew, growing up and the way ‘holiday home’ literally housed itself within the landscape. Inviting you in, like a Hansel and Gretel modern day house in the woods, but without the bread crumbs! A home from home. A solid form with a sloping roof and a chimney, that suggested associations of safety and comfort. 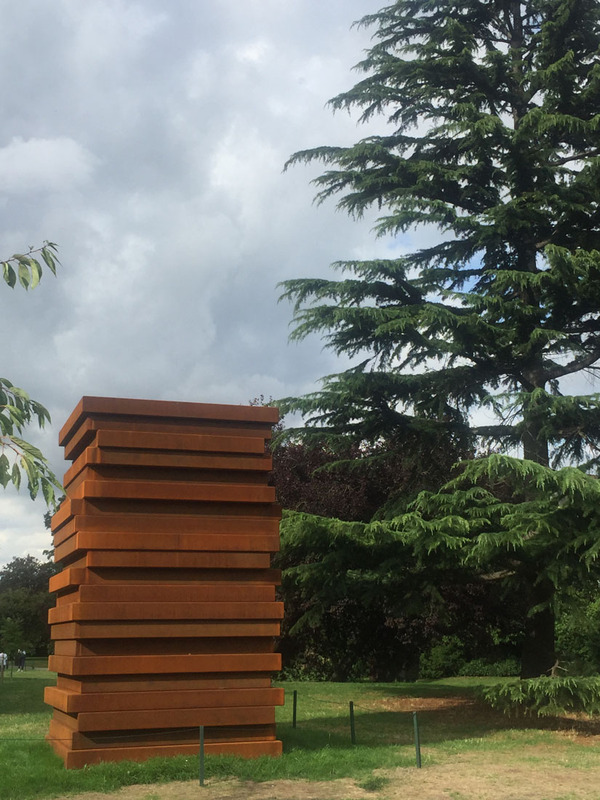 Another installation, Sean Scully’s ‘Shadow Stack’, was a favourite too. 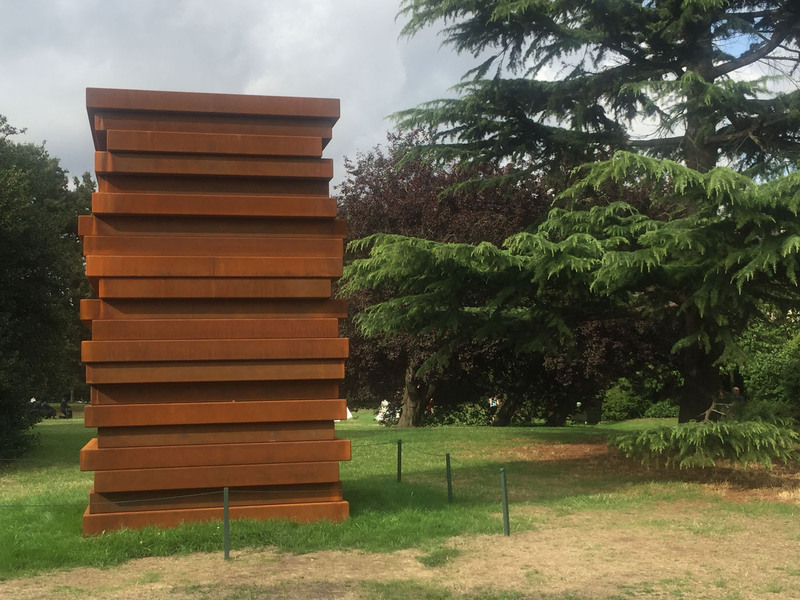 The rusty patinered colour, (made from corten steel), against the backdrop of green, blue sky, grass and age old fir trees, again worked perfectly within the landscape. The contrast of a heavy, solid form and the openness of tree branches, was great juxtaposition. With the imperfect jutting stacked edge, reiterating the alternating stripe motif found in Scully’s Landline series of paintings. (From which the sculpture belongs to). The colours, a huge variation of rusty dulled oranges are gorgeous, authentic, with the material being a great canvas for the changing weathered tones. It was after reading a quote from Scully, “its about stacking, putting things in order,” that I realised that this was in part, why I liked it. 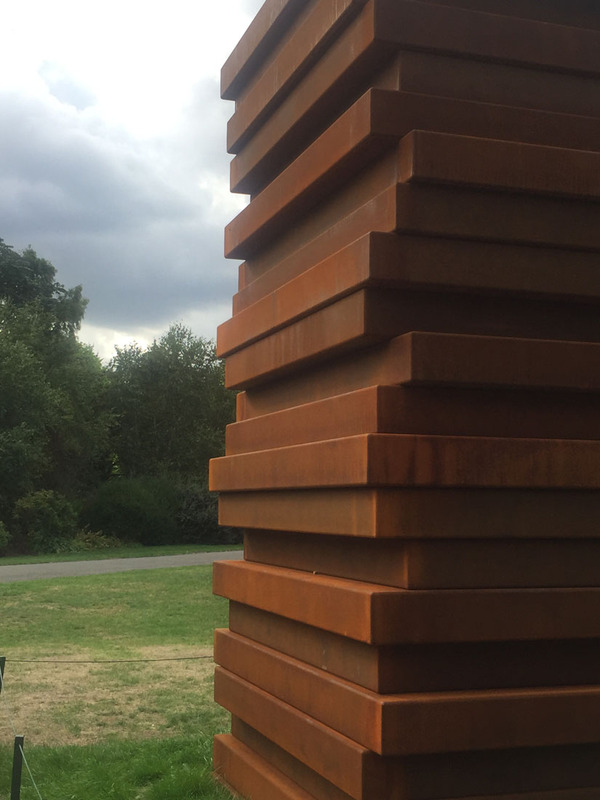 ‘The stacking’, the imperfect jutting out balanced order calmed the mind and made sense to me. ‘Shadow Stack’ had a simple perfection to it. 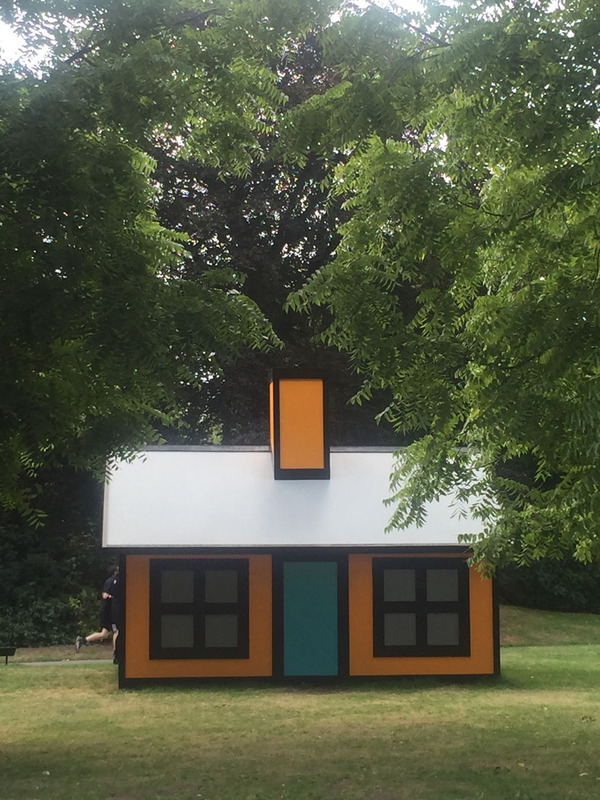 If you missed Frieze Sculpture Park this summer, there’s more installations featured on our facebook page. 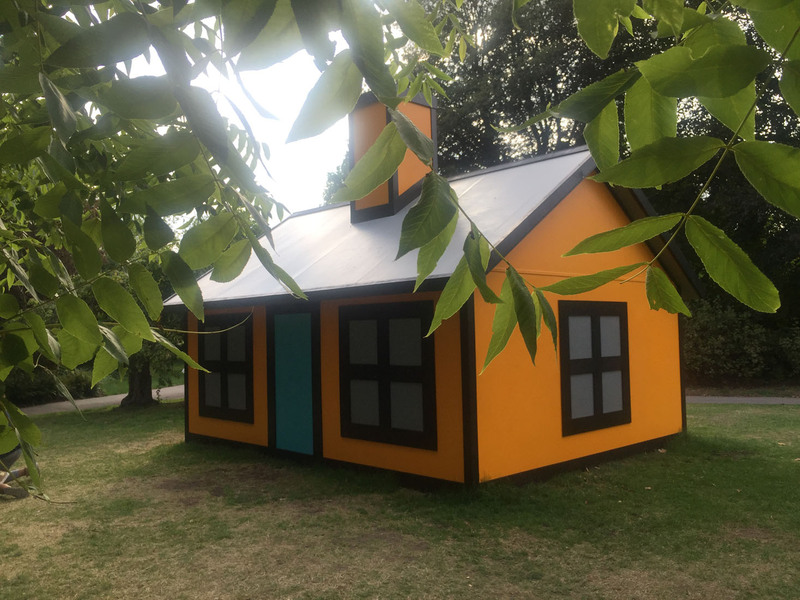 For one, we can’t wait for summer 2019 and more art in the park! There is something about art in the landscape that I love. Something that stops you, makes you take time out, look, consider and pause. Anything that can jarr you out of yourself and take you to another thought process, away from what is going on in your head, your world, just has to be a good thing! Art and sculpture has the power to engage your senses and make you smile. Visually appealing in genre, finish, humour, works and installations make you question why you like them and how they move you. Also there dynamic within the landscape and impact on the neighbours! In the summer I was lucky enough to treat myself, mind, body and soul! (as it was a bliming long walk that day)! 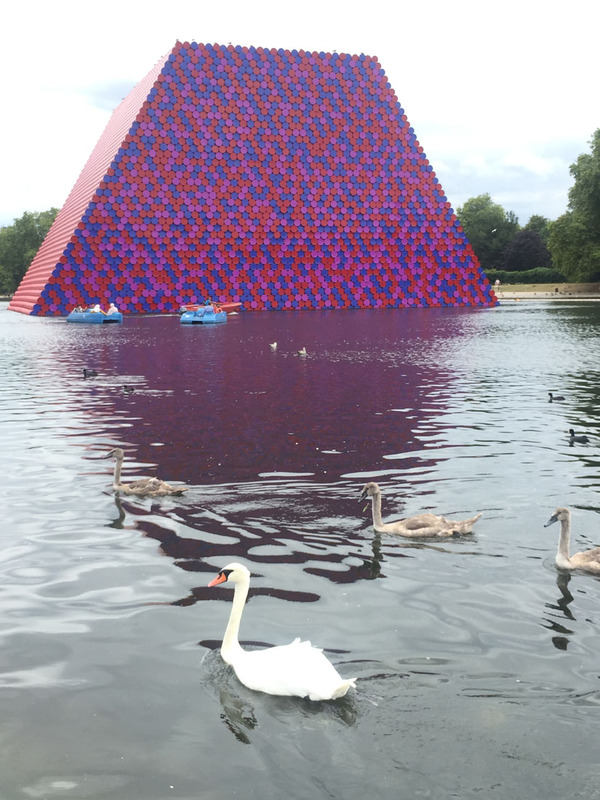 to a creative day wander and view both the floating installation on the Serpentine and the huge variety of sculptures on the grass at Regents Park Summer Frieze exhibition. (More of Frieze in another blog). Let’s start with the lake! If I’m honest with you I really did not think I would like the floating triangular tolberone’esque! 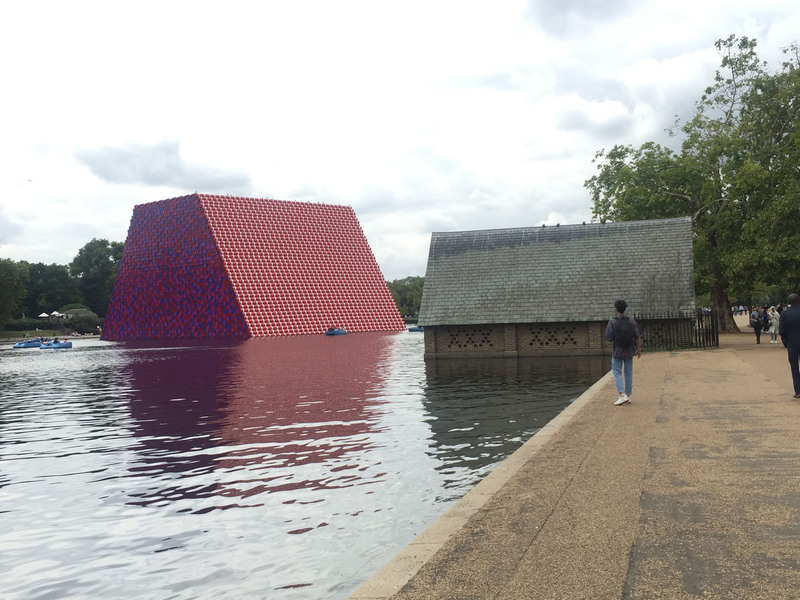 cube on the Serpentine. But I loved it!! It made me smile. It literally brightened up my day. Why did I like it! I loved how the bright form revealed its self to me, as I walked up from different parts of the park and around the lake. I loved, looking back when I departed, how through a gap in the trees and green leaves bouncing slightly in the breeze, that I could spy something that looked pink, purple, red.. what was it? 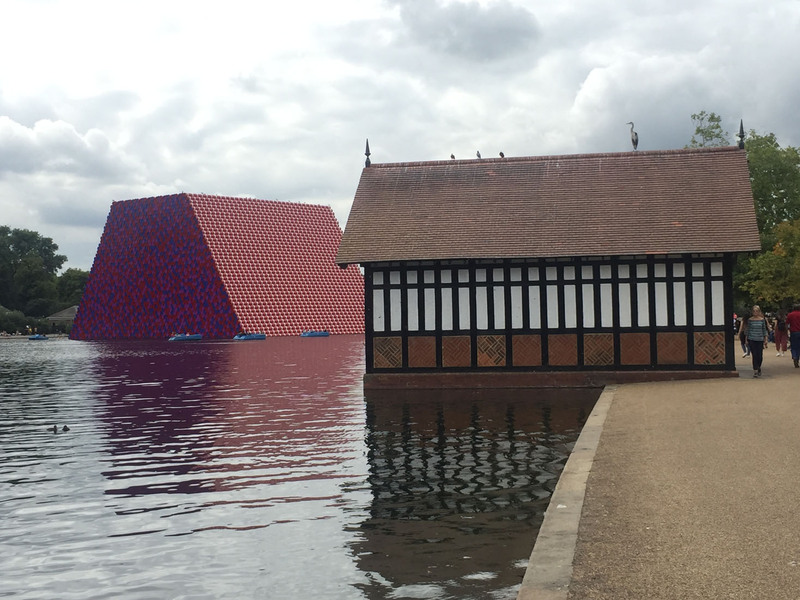 Mastaba – blocks of mosaic colour, with the solid form contrasted with the ever changing reflections over the course of time, dappled on the waters surface. 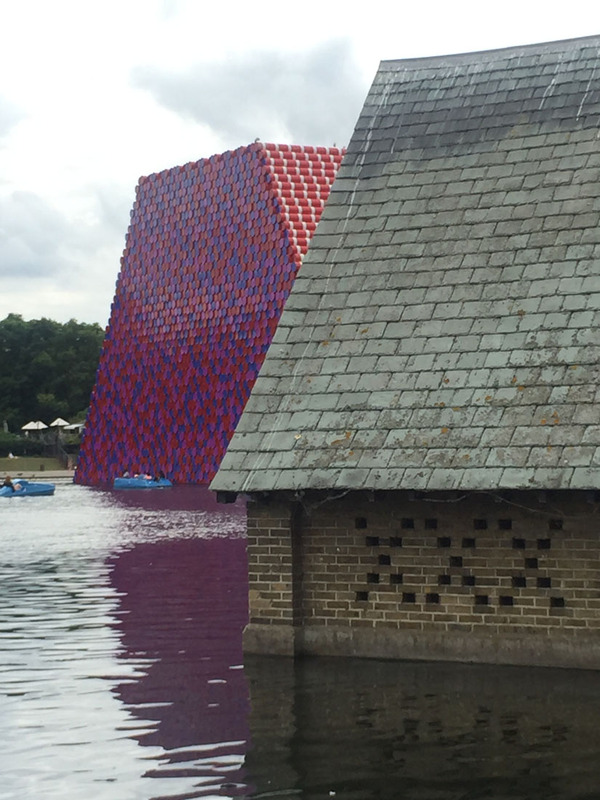 The artist Christo completed ‘The London Mastaba’, 20 metres high, this summer. 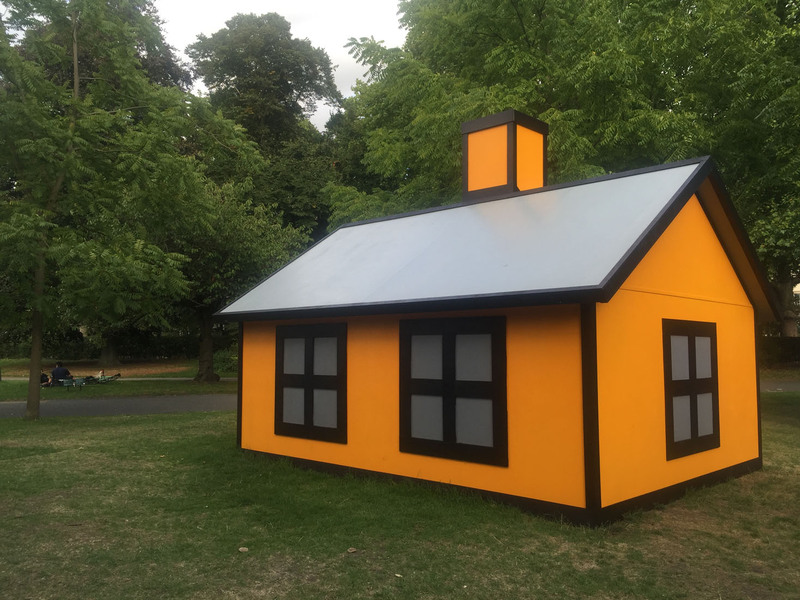 With the unveiling in Hyde Park on the 18th June 2018. It represents his resolution, along with his late wife Jeanne-Claude, to follow their mutual passion for the structure and to make art free. A mastabas is a type of Egyptian tomb, taking the form of a shape with a flat top/roof and sloping sides. With the original construction being mud bricks, from the Nile. The meaning translates to ‘eternal house’ or ‘house for eternity’. Mastaba is from the Arabic word meaning ‘stone bench’. Christo and Jeanne-Claude’s passion for this shape, translated into the creation of the floating form, we see today. 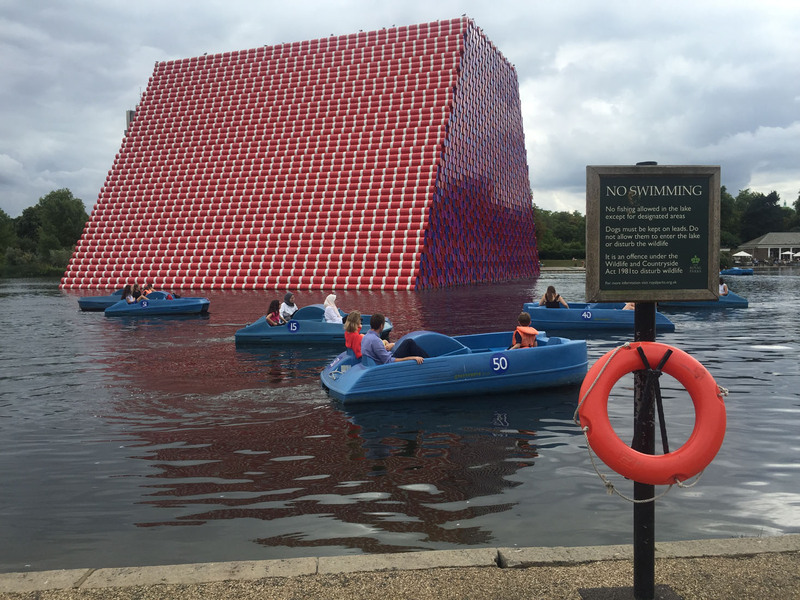 Made up of 7,506 painted barrels, the tops are a vivid purply pink, red and blue. So one side, is a candy mosaic of coloured round drum tops. With the wider sloping sides the vertical sides of the drums, in a much deeper, darker, red; punctuated with white rings. The deeper red suggests the colour of conventional roof tiles, en masse and part of me wonders how jolly it would be for the artist to work on a building project with a developer today. The colours chosen vibrate, contrast and reflect in the ever changing light and stand out amongst the park colours, that we all recognise. 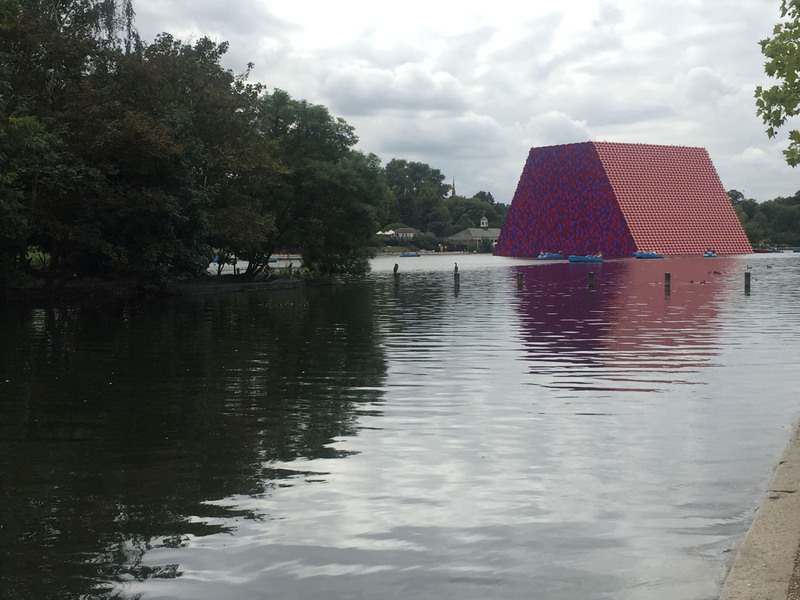 Shadows of the Mastaba float on murky dark Serpentine water, where wild water swimmers can barely see an arm stroke in front, as it hits the opaque surface. The structure is such an anomaly, on the waters surface, but it just works! You would think, as if by magic, that it floats – but scaffold and anchoring secure the structure in the lake. 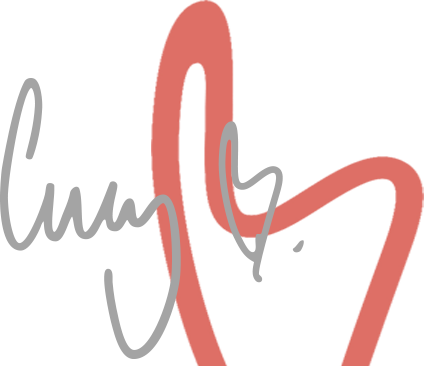 An amazing project that was self funded, with funds from the sale of their original art. Christo quotes ‘I won’t give a millimetre of my freedom (away) and damage my art,’ in relation to his freedom and independence from galleries and patronage. He is indeed a free artist who is not confined by commissions. In todays art world it is a pleasure to hear an artist who lives by his own rules. 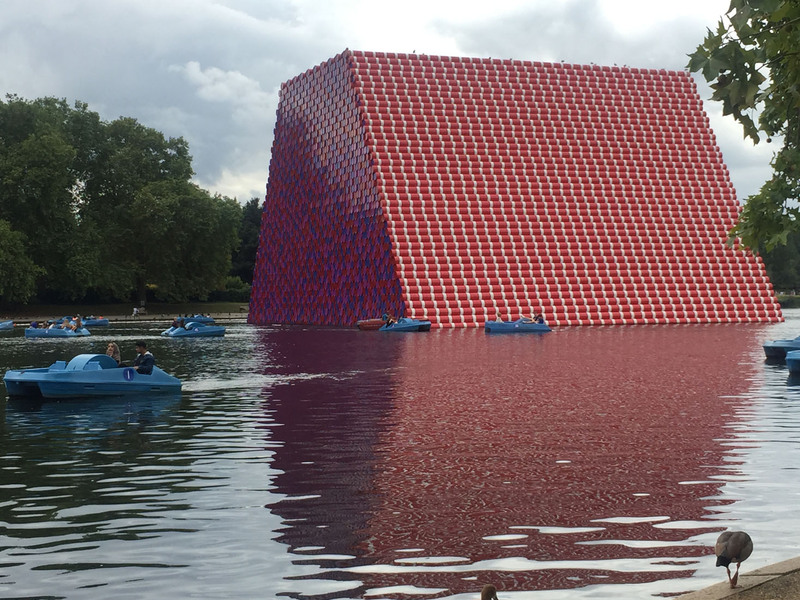 I hope you got to see The London Mastaba, one fine day this summer.